Romhacking.net - Review - Great game - great patch! 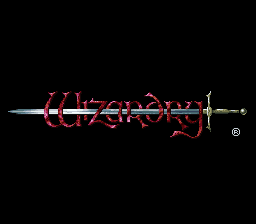 Wizardry: Bane of the Cosmic Forge is a role playing game for the Super Nintendo. Game quest full playable in English (some monster actions and spells not translated, and battle text need repointering). NOTE menu is need some analysis, I need save state or savegame with full inspected item list PLEASE if you have one email to me! Portrait edit menu partial translated. I found some bug (game freeze if sell some special item (Maiden Head,…)) in original game which need fix. 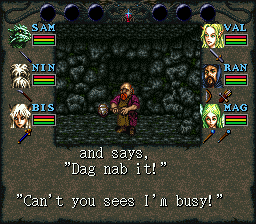 April 2011 Update: This translation is taken from the PC-DOS version of the game, almost word for word. It is not a translation of the Japanese version and the English text is very different from the original. In some cases, dialogue is repeated in different situations just like the PC version, however, the Japanese version does not actually do this. August 2013: Fixed QuickStart Party names and a few spelling corrections. MrRichard999 Hacking Fixed Quick Party Selection names. Great game - great patch! If you can survive and make it to getting your party level 2, this game really takes off. Until then, it’s very difficult. Well worth sticking with it though. I am thoroughly enjoying it. My party is level 4/5 and the game is really opening up.